"The vast majority of people don't even realise there is a problem to solve." Our Save the Planet t-shirts help get the message out that all is not right with planet Earth, while you are having a cuppa or are out and about. 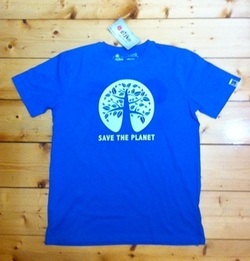 Account Name: "Save the Planet Party"
Include your name as the "Lodgement Reference"
Our t-shirts are sourced from Etiko, an ethical manufacturer and importer of fair trade clothing and sporting goods. They are 100% certified organic and certified fair trade, available in blue for unisex and women's tight fit, and green for children's sizes, all featuring our great logo. Check Etiko site for sizing. Prices are set at just above cost at $30 for adult shirts and $20 for kids, we can calculate postage which usually ranges between $10-20.